Published by Wynkyn de Worde, Christmasse carolles newely enprinted (1521). 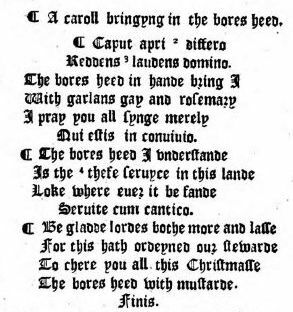 Source: Edwin Bliss Reed, Christmas Carols Printed In The 16th Century (Cambridge: Harvard University Press, 1932) Plate A, p. 3. The original is in "Old Blackletter:" The bores heed in hande bring I. This is the earliest printed Christmas carol to survive to this century. Thus endeth the Christmasse carolles newely enprinted at London in the fletestrete at the sygne of the sonne by Wynkyn de Worde. The yere of our lord. M.D.xxi. I shall not give other Instances of Alterations in old English Pieces, only I will beg leave here to give an exact Copy of the Christmas Carol upon the Boar's Head, (which is an ancient Dish, and was brought up by K. Henry I. [sic] with Trumpets before his Son when his said Son was crowned) as I have it in an old fragment, (for I usually preserve even fragments of old Books) of the Christmas Carols printed by Wynkyn de Worde, (who, as well as Richard Pynson, was servant to William Caxton, who was the first that printed English Books, tho' not the first Printer in England, as is commonly said, printing being exercised at Oxford in 1468, if not sooner, which was several Years before he printed any Thing at Westminster) by which it will be perceived how much the same Carol is altered as it is sung in some Places even now from what it was at first. It is the last Thing, it seems, of the Book (which I never yet saw intire) and at the same time, I think it proper also to add the Printer's Conclusion, for this reason, at least, that such as write about our first Printers may have some notice of the Date of this Book, and the exact Place where printed, provided they cannot be able to meet with it, as I believe they will find it pretty difficult to do, it being much laid aside about the time that some of David's Psalms came to be used in its stead. This description is from Hearne's Guilielmi Neubrigensis Historia, Volume 3 of 3 volumes (1719), p. 744-5 (a copy is available at the Bavarian State Library, Guilielmi Neubrigensis Historia). Source: Thomas Frognall Dibdin, Typographical Antiquities. Vol. II. (London: William Miller, 1812), pp. 250-251, corrected from the copy of Volume III at the Bavarian State Library. Hearne's comment that finding a copy will be 'pretty difficult to do' was prophetic; no other copy has been found, to my knowledge. Hearne's footnote to the item concerning the crowning of the son of King Henry I was to: Hollynshed's Chron. Vol. III. p. 76. However, after some research, I found this account in Hollinshed's Chronicles of England, Scotland, and Ireland. Vol. II of VI. (London: J. Johnson, et al., 1807), p. 130. The crowning was, according to Holinshed, by King Henry II. — not Henry I. — of his 17 year-old son who was called "Young Henry." The date of the crowning was 14 June 1170. For the full account, see The Crowning of Young Henry in 1170 and The Boar's Head Feast for Young Henry, 1170. Hearne's footnote to 'David's Psalms' was: Certain of David's Psalmes intended for Christmas Carolls fitted to the most common but solempne Tunes, every where familiarly used: By William Slatyer. Printed by Robert Young 1630. 8o. I have been unable to locate a copy on-line. William of Newburgh or Newbury (Latin: Guilelmus Neubrigensis) (1136?–1198?). His major work was Historia rerum Anglicarum or Historia de rebus anglicis ("History of English Affairs"), a history of England from 1066 to 1198. It was republished by Thomas Hearne (1678-1735) as "Guilielmi Neubrigensis Historia sive Chronica rerum anglicarum ..." in 1719 by E theatro Sheldoniano in Oxonii in 3 volumes. Written in Latin. It was available for sale at ABE Books in April, 2013, for £1,358.14 (US$ 1991.98). There are two other old carols that have content in common with this carol. One of these was included in a manuscript written by Richard Hill, a London grocer, who kept his "common-place book" in the early 1500s. See The Boris Hed In Hondis I Brynge. This manuscript was donated to the Balliol College, Oxford (Manuscript 354, folio. 178, pp. 374-375), but was lost when it fell behind a bookcase. It wasn't found until sometime in the mid 1800s. It was first printed by Furnivall, The Babees Book in 1868, and then by Dyboski, Songs, Carols, and Other Miscellaneous Poems (1907). See also James Anthony Froude, 'The Commonplace Book of Richard Hilles,' in Fraser's Magazine for Town and Country, August 1858, Vol. LVIII, No. CCCXLIV. There was another carol on this leaf, A Carol of Hunting (First line: As I came by a grene forest syde). Although there is nothing in the carol that relates to either the holiday or the holy day of Christmas, nevertheless, it is included as a Christmas carol simply because it is found in a book of Christmas carols. The earliest copy that I've found, a reprint from Wynkyn de Worde (1521), is from 1801: As I Came By A Grene Forest Syde. An older version of this carol was printed by Richard Hill in his Common-place Book, As I Walked By A Forest Side - Froude (1858). It is believed that this carol is the first in a chain of carols that would eventually be performed annually at Queen's College, Oxford. See: The Boar's Head in Hand Bear I - Queen's College, 1921.